No matter how frigid the weather might be, go out with sharp pruners and gather forsythia bouquets. I clip mine from the big shrub in my front yard (above). Choose branches of varying lengths and shapes for the best sculptural effect. Indoors, cut your material to attractive bouquet lengths. Then smash the ends with a hammer, and set them in a bucket of warm water. A one-hour soak is all it takes to hydrate the branches and snap them out of dormancy. After soaking, arrange the branches in a vase of warm water, to which a few drops of liquid bleach has been added. My forsythia goes in the sun on the parlor plant-stand. There, as you can see from the very top photo (which was snapped by Patrick Harbron), the gold-trussed stems look cheerful in conjunction with pots of pink wax begonias and fragrant purple and white Primula malacoides. Ah, such beauty achieved for no cost at all. Forsythia. Cut late-December or early-January; 2-3 weeks to bloom. Honeysuckle Bush. Cut mid-January; 2 weeks to bloom. Crab Apple. Cut early February; 3 weeks to bloom. Flowering Cherry. Cut early February; 2-4 weeks to bloom. Flowering Quince. Cut mid-February; 4 weeks to bloom. Willow. Cut any time in February; 2 weeks to bloom. Red Maple. Cut late February; 2 weeks to leafy splendor. Apple. Cut mid-March; 2-3 weeks to bloom. Flowering Dogwood. Cut mid-March; 3 weeks to bloom. If I were you, I’d go collect an armful of “dead” twigs today. For these, in very short order, will produce for you an extraordinary spring portrait. Beautiful arrangement, Kevin. I'm going to trudge through the slushy snow today and cut some of my forsythia. It needs this pruning, anyway. That's good news! Someone told me that forsythia couldn't be forced until March, when the weather turns warmer. I guess your own flowering branches prove otherwise! Kevin, just curious if you have ever tried to force lilac. 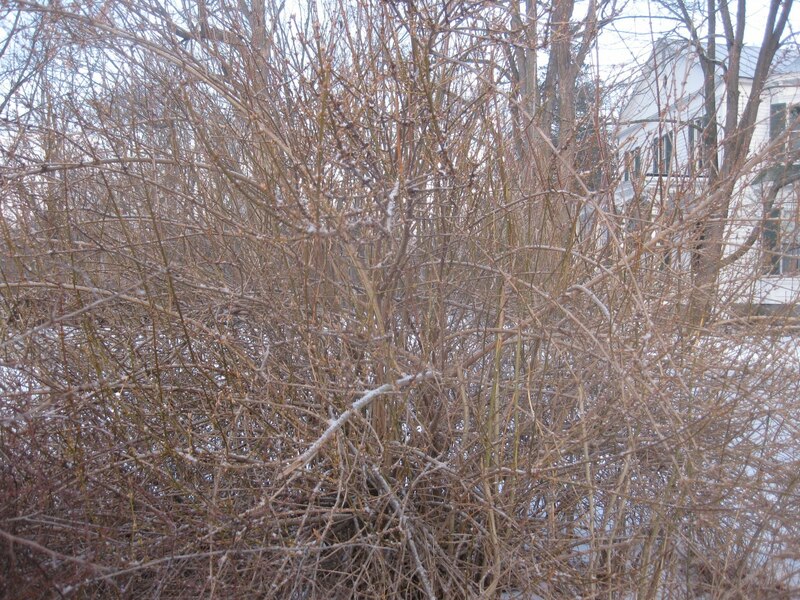 Samantha – forsythia requires only a brief chilling period outdoors — 30 hours of below 40-degree weather. And the hours can be cumulative. That's why we can cut and force its branches so early. Andrew – I have tried and tried to force lilac, but my efforts were in vain. If anyone reading this has had success, by all means tell us your secret! I am fascinated by the picture of flowers on your blog. Everything looks so perfect on your blog. Keep up the good work. Welcome, Rose! Thank you for your kind words. That is a gorgeous, gorgeous arrangement. 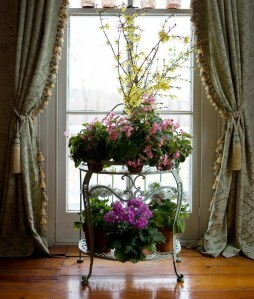 Think I'll do something similar, using African violets instead of wax begonias (which I don't have) to surround the forsythia vase. What do you think? 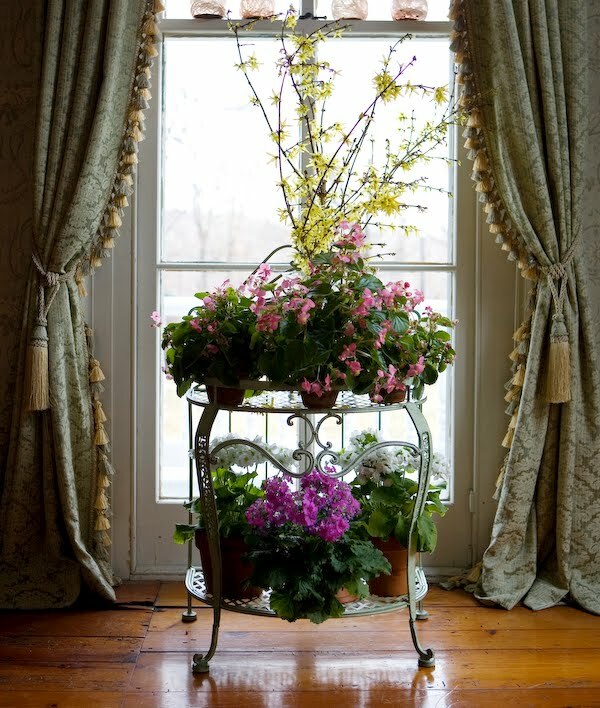 Gardenlady – I think a colorful crowd of African violets, set at the base of your forsythia vase, would look stunning! Go for it! Kevin: I don't know which is lovelier, the forsythia, the wax begonias, or the primroses. Anyway, I feel really inspired to cut some forsythia branches now! also, how do you manage to keep water off your hardwoods? I have a beautiful sunporch with all these hooks in the cieling. I wanted to hang furns last year but I was worried about the water dripping onto the hardwood floors. Lisa – the table (actually it is a wrought-iron plant-stand), was purchased several years ago at an antiques market in Ipswich, MA. Regarding the drapes. We had these made by a local decorator, who, in a previous career, worked as a costumer on Broadway. I wanted all hangings for this old house to be historically appropriate. So glad you like them. Concerning your ferns, simply water them with ice cubes. Don't worry – the coldness won't harm your plants. As the ice melts, it will be absorbed slowly by thirsty root systems. Thus you will not encounter moisture dripping onto your floors. And lucky you are to have a sun porch! It will be nice to have something that makes it feel like an early spring. I trudged through mud this morning to snip 2 dozen forsythia branches. They are soaking in a bucket now. When I get home from work I'll put them in my big cobalt-blue vase. Can't wait for the yellow flowers to sprout! I think the yellow with the blue will look stunning. GothamDan – you probably have all kinds of twigs and branches on your property that can be forced. Why not give it a try? Erika – Good for you! And, I think forsythia's golden flowers in your cobalt-blue vase will look nothing short of divine. Send me a picture, if you wish! Hmmm, I need to prune my apple tree. I guess I'll try to force those cut branches! Katreader – apple tree prunings are well worth forcing. At this time they are slower to bloom than forsythia. But bloom they will…the buds appear pink at first, then open white, with bright yellow stamens. GORGEOUS. 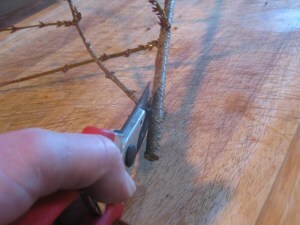 Anonymous – I've tried forcing magnolia branches using the same vase-technic I use with forsythia, etc. Although the branches produced foliage, their flower buds never truly opened. It seems you are giving the branches what they really want: coolness and extra-high humidity. Thanks for the tip! Kevin–Great job! I love that you bring spring in months early! We also force our magnolia, though its more of a production–We keep the cut branches in a bucket in our basement (around 53 degrees) for three weeks under a disposable, light-weight tarp, misting the branches with water once a day. Then we clean the husks off the opened blooms and move upstairs. This is the way I was taught to do it. Would putting the magnolia branches directly in a vase right after cutting work as well? –Does anyone know how many days it takes for forsythisia to bloom? Marcia – Welcome. At this time, it usually takes forsythia 10 to 14 days to bloom indoors. However, if you live in a warmer zone than me (I'm in zone 5-b), and your shrub is already showing signs of growth, the branches might bloom a little earlier for you. It's worth a try! Kevin, I am finally trying this for the first time. Question about the wait time and water replenishment: Do I add more bleach, or just continue to refill with water? Robin – great to hear from you…hope your weather warms up! At this time, forced branches of forsythia should bloom for you in about 7 days. A few drops of bleach added to the vase will keep the water sweet. As evaporation occurs, just top off with more fresh water; no need to add more bleach. Love the bringing in nature to brighten up the inside of our homes. Curious about the role of bleach in the water since it is a toxin to anything living. Hi Wolfgang – You would think that bleach would be harmful to cut branches of spring-flowering trees and shrubs. But a tiny amount of bleach (a 1/4 tsp per quart of water) actually prolongs the life of the branches by killing off harmful bacteria. Florists routinely add bleach when creating cut-flower arrangements. Kevin, i brought in forsythia branches about 3 weeks ago, and the buds have opened–all into lovely green leaves. The green is nice, but–no blooms! Does this mean my bush will only leaf out with no flowers? I was careful not to prune when i would have cut off buds. Why else would a forsythia not bloom?